Americanah is a love story, not the kind of love stories I grew up reading, those with really beautiful women and handsome tall guys. In fact, the lovers in this one aren’t too attractive, but their love is. Their love is beautiful, but then it is tried, beaten, stretched, yet it endures and gets stronger. Okay, love aside. Americanah deals on the subject of race and hair. You may wonder how hair could be an issue, but it is in this book. The book begins in a hairdresser shop, where Ifemelu goes to make her hair for her return journey to Nigeria. There, she muses on her decision to go back home, and then, in Adichie’s well-known style, the narrative jumps back in time, and we are transported to Ifemelu’s teenage years. We see her as a girl with strong opinions and who isn’t afraid of saying what’s on her mind, a trait which she always gets rebuked for, especially by her elders. She meets Obinze in her secondary school, and they fall in love. The narrative follows them through their secondary school to their university days, where things begin to fall apart. University lecturers are frequently striking because the military government delays their salaries. This forces students to remain at home with nothing to do. And then people begin to travel out of the country, in search for greener pastures and for better education. Ifemelu grabs the opportunity when it is presented to her and she goes to America to study, while Obinze hopes to join her later. While in America, Ifemelu notices something she has never thought about before – race, and she would later say, “We all wish race was not an issue. But it’s a lie. I came from a country where race was not an issue, I did not think of myself as black and I only became black when I came to America." The issue of and racism makes her start a blog: Raceteenth or Various Observations About American Blacks (Those Formerly Known as Negroes) by a Non-American Black. I loved the blog posts that appeared from time to time, a good innovation, which left me marveled. I’ve never read any novel where this was done, and I found it impressive, not just because of the concept, but because it doesn’t distract you from the main story, although it makes you think and wonder, and you can’t help but mark some of the posts so you could visit them later. I enjoyed this book. There were funny scenes where I couldn’t stop myself from laughing. And the dialogue is good; it felt so real and I could identify with it, especially in the Nigerian settings. I loved Adichie’s descriptions of Lagos, London, and all the American cities where Ifemelu sojourned. Even the character descriptions, sometimes funny, create solid images in the head. And the writing is superb. Americanah has a large cast of memorable characters. There’s the younger and older version of Ifemelu and Obinze; Obinze’s mother, one of the coolest fictional mother I’ve ever read; Ifemelu’s Dad, who uses big vocabulary and doesn’t hesitate in blaming the government for his misfortunes; Ifemelu’s mother, devoted to religion and isn’t rational in her thinking sometimes. Then there’s Aunty Uju and her son, Dike; Blaine, Ifemelu’s African-American boyfriend, who she refers to as “Professor Hunk” on her blog. And then Curt, the White American Boyfriend, rich, always cheerful and easy to please. I loved each of these characters. They have enough depth and substance – they felt too real. Not the kind of characters you will easily forget. I think my favorite among them is Obinze’s mother. She’s a thoughtful woman with a calm demeanor, the kind of woman I’d listen to talk and talk and I won’t get bored, because she spits wisdom from her mouth. Overall, I’d say Americanah is a remarkable book, a thoughtful book, a book filled with truth; it touches other issues such as social inequality, immigration, self-acceptance, loss of cultural identity, and change. The book remains with you after you finish reading, begging you to “read again.” Without doubt, I’ll read this book again at a later time. The Purple Hibiscus has always been my favorite Adichie novel. Now, Americanah, I think, is my favorite. It’s a Five Star read, and although I didn’t like the book cover, I still look forward to Adichie’s next book. How did you get your papers, huh? Cool lines all the way. If Achebe's novel was the story of my father, Adichie's novel is my story. It feels real, so real! "If Achebe's novel was the story of my father, Adichie's novel is my story." I agree with you. And Yeah, there are lots of cool lines and I feel like adding them to my review would be like giving away too much spoilers. It's best for the reader to come across them by themselves. What a wonderful review! The race issue hits home with me because I grew up on an island with few white people. I was usually the only white kid in the room. It wasn't until I moved to the states when I actually felt like a white person because I looked like everyone else, but I didn't share the same views. I was included for the first time but in a way that felt so superficial. I love that they lived their lives, grew up some, then reunited. 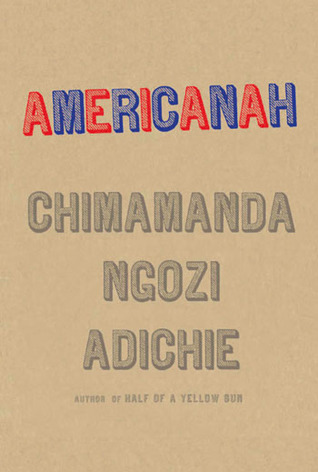 I added Americanah to my Goodreads shelf. Happy Reading!! Thanks, Robyn. I have never travelled out of Nigeria before, so maybe I cannot really relate to the race issue. I have friends abroad, though, and some of them tell me similar stories. I'm glad you added the book to your TBR. I'm sure you will like it. I'm glad you love the review. I look forward to seeing what you think about the book when you're done with reading. You're welcome, buddy. :) I'm glad you like the review. i dont totally agree with u cos u didnt say anything about the flaws of d book. there were so many minor xters, too many blog posts and the book was too long unnecessarily. ifemelu too is so unlikeable...unhappy, judgemental, hypocritical, self righteous and i wonder if she really loves Obinze or justthinks its her right to be with him? that aside, Adichie was just writing abook of her views on race, politics, hair and all and making her xters do the talking. Hi, Chii. I agree with on the so many minor characters. But then in a book that big, I didn't have any problem with it. I purposely didn't read other reviews before I posted mine, so it won't affect my judgement of the book. And I wrote this review just the moment I finished reading. About Adichie writing her views on race, politics, hair, etc, this stuffs only dawned upon me when I read other reviews. When I read the book for a second time, maybe I'll write another review to talk about my reading experience. Thanks a lot for reading and for sharing your thoughts.